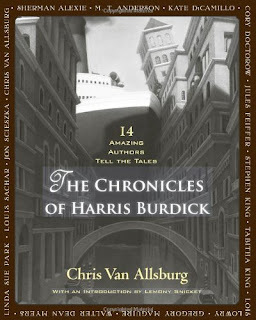 The Chronicles of Harris Burdick: Fourteen Amazing Authors Tell the Tales is an anthology of stories inspired by Chris Van Allsburg. In the introduction to The Chronicles of Harris Burdick, Lemony Snicket says "the story of Harris Burdick is a story everybody knows". I must be living under a rock because somehow I was unaware of Harris Burdick. If you are like me and you've never read Chris Van Allsburg's The Mysteries of Harris Burdick, it's a picture book of 14 detailed drawings (said to be drawn by a mysterious Harris Burdick) each with a title and a caption. The reader is invited to make up their own story based on the picture using the caption as a prompt. I love this idea, and it is the basis of The Chronicles of Harris Burdick. Fourteen successful writers contributed to The Chronicles of Harris Burdick with each creating a story based on the drawings of Harris Burdick. This was my first exposure to the imaginative drawings, and I found myself instantly wondering the story behind each one and anxious to see what each author envisioned for their particular illustration. My favorite drawing is Mr. Linden's Library and the caption "He had warned her about the book. Now it was too late." is so perfectly creepy. My favorite story, however, is probably the one associated with A Strange Day in July with the caption reading "He threw with all his might, but the third stone came skipping back.". It was a fun, twisted little story of twins who decide they are going to make everyone believe they are triplets. Another of the stories featured in The Chronicles of Harris Burdick is Stephen King's The House on Maple Street. It was originally published in Nightmares and Dreamscapes, but it was inspired by the Harris Burdick drawing of the same title. It now makes perfect sense to me why there is a random illustration in Nightmares and Dreamscapes! I will return to the rock I am living under as soon as this review is complete. If you are a fan of Chris Van Allsburg's The Mysteries of Harris Burdick, you are sure to enjoy The Chronicles of Harris Burdick. I think it would also be a great way to introduce short fiction to young readers. It was an odd read, but also a delightful one at that. Oooh I've never heard of this one!!! Awesomeness chick! !